On August 17, 2017, a cosmic event was observed for the first time ever via both gravitational and electromagnetic waves! The event – named GW170817 – was produced by the cataclysmic collision of two neutron stars. There is certainly no shortage of papers written about this historic multi-messenger detection. Here is the list of 67 preprints released on the day of the announcement of the binary neutron star coalescence. In this bite, we will be discussing the implications of GW170817 for the stochastic gravitational wave background, which is the random gravitational wave signal generated by an abundance of weak, unresolved sources. We confirmed for the first time from this detection that merging neutron stars are indeed a source of gravitational waves in the universe. This is in addition to black hole coalescence events, which we have detected gravitationally several times already. Merger events that are loud and/or nearby can be detected as individual sources, such as GW170817. Many distant merger events will be sub-threshold, meaning that they will not be loud enough to detect on their own. However, they will still contribute as a collective to the gravitational radiation we receive on Earth. Weak, unresolvable sources are therefore likely to be detectable en masse as a background gravitational wave signal across the sky, similar to the Cosmic Microwave Background. The background is the superposition of many random, independent events and will produce a signal like static; hence, we call it the stochastic gravitational wave background, because it can only be characterised statistically. The signal due to the stochastic background of gravitational waves is expected to be much weaker than the detector noise. Luckily, we can extract the signal from the noise by cross-correlating the data from multiple detectors; it has been shown that we can always increase the signal-to-noise ratio by correlating the outputs of two gravitational wave detectors for a sufficiently long period of time. From the five black hole coalescence events (GW150914, GW151226, LVT151012, GW170104 and GW170814) we have observed so far, we already estimated the rate of black hole mergers in the universe. Similarly, from the recent neutron star coalescence detection (GW170817) alone, we obtain a binary neutron star merger rate. These rates tell us how frequently the weak, unresolvable merger events that contribute to the stochastic background are occurring. Therefore, we can use them to estimate the amplitude of the stochastic gravitational background. Up until the recent neutron star merger event was observed, the neutron star merger rate was uncertain, but GW170817 has allowed us to obtain an estimate of the binary neutron star contribution to the stochastic gravitational wave background: it turns out that they contribute significantly. 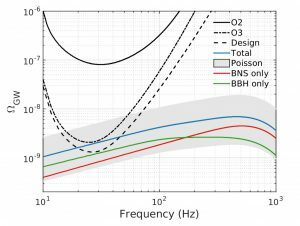 When we add the contribution from the binary neutron star (BNS) background to the binary back hole (BBH) background , we almost double the expected amplitude in the frequency band most sensitive to stochastic backgrounds (near 25 Hz) [see Figure 1]. 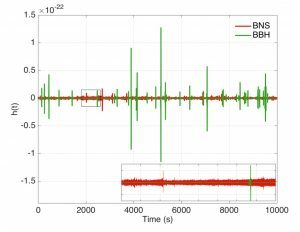 Crucially, because the BNS mergers add on a sizeable chunk to the amplitude of the signal, we may detect the gravitational wave background much sooner than previously anticipated based on the BBH estimates alone! Figure 1: Predicted background for binary neutron stars (red), binary black holes (green) and the total background (blue). The grey shaded region denotes the error bars for the total background. The black curves are the sensitivity curves for observing runs (O2, and O3) and design sensitivity. Figure 1 in paper. Although the BNS and BBH backgrounds have similar signal amplitudes, they are very different in character. The waveform of a neutron star merger is long relative to the time between merger events. Therefore, the BNS events generate a continuous background resulting from a superposition of sources overlapping in time [see Figure 2]. In contrast, individual black hole merger waveforms are shorter and unlikely to overlap, yielding a background with sudden spikes that are well-separated in time [see Figure 2] – just like popcorn popping intermittently as it is heated! Figure 2: Simulated time series for the BBH (green) and BNS (red) background signals. Figure 2 in paper. Once an astrophysical gravitational wave background is detected, we would like to determine the precise nature of its composition; the different properties of the times-series for the BBH and BNS backgrounds may allow us to disentangle them from each other. When will we detect the background? Probably the most important question answered in this paper is: when will we actually observe this background? The LIGO/VIRGO collaboration has determined that an astrophysical gravitational wave background could be detected at a statistically significant level after 18 months of observation time. However, this is the most optimistic possible case. Happily, there are reasons to believe we could detect it even earlier! There are likely to be additional compact object mergers (on top of BBH and BNS) out there, for example black hole-neuton star binaries, which could boost the background signal further. Also, specialised searches that have been cleverly designed especially for the task of gravitational wave background detection could be more sensitive to the signal. Searching for an individual, resolvable chirp in LIGO data is like searching for a needle in a haystack; most of the data is of no interest and discarded, with the exception of the tiny volume of data that happens to contain the chirp. In contrast, for the purposes of analysing the stochastic background, all the data is useful. In this sense, detecting the background would be a serious step forward for gravitational wave physics. Good point – sorry about that! Thank you Lisa for this useful post. I have a question that may be irrelevant with this post. about difference in time between GW and EM arriving. what’s that reason? The paper points out that such a delay is not unexpected: it may take some time for the GRB jet to form before it can propagate. The time delay is consistent with current models of GRBs.